Time Life Music’s Golden Age of Country is one of the best collections they have ever released. 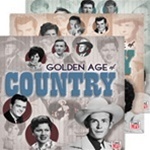 Golden Age of Country first made its appearance in 2009 and continues to be a top seller for us at As Seen on TV Web Store. With 158 hits from country legends like Johnny Cash, Patsy Cline, George Jones, Kitty Wells and more, it’s easy to see why. These are classic country songs from some of the greatest country artists ever. Golden Age of Country is a must have for any Country Music lover.